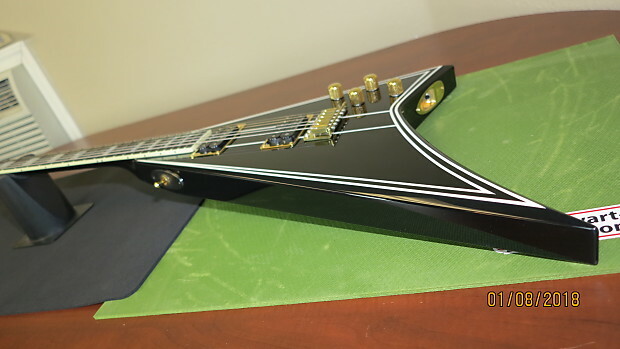 Jackson USA Custom Shop reproduction RR Jackson Concorde made in 2006. 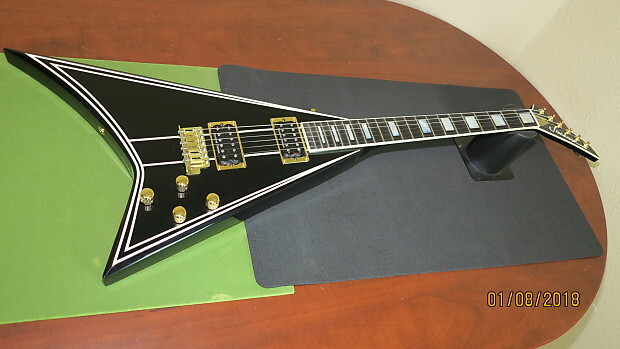 This Jackson Custom Shop RR Concorde guitar is a derivative of the 1992 Jackson Guitars reproduction, of the first original Concorde guitar that world renowned guitarist Randy Rhoads went to luthier Grover Jackson to have built in 1980. 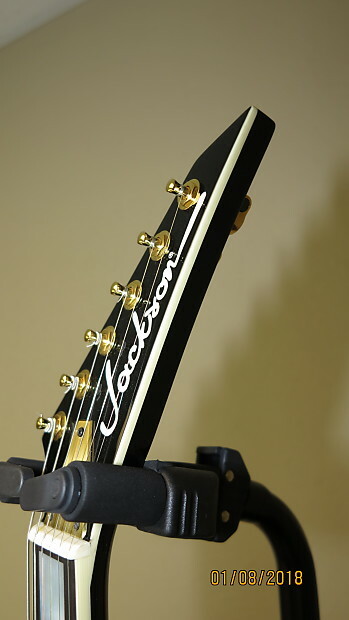 This specific Jackson RR Concorde version was a special ordered reproduction of the 1992 Jackson Guitars RR Concorde. 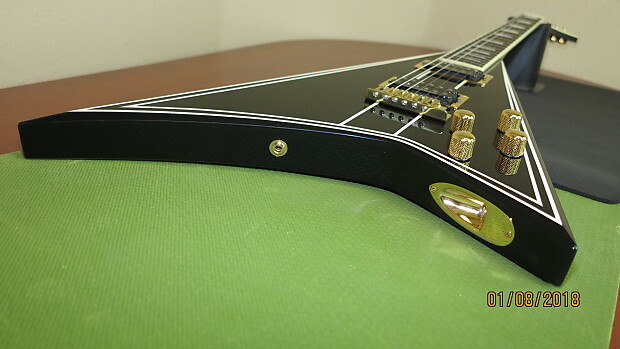 This special ordered version of the RR Concorde reproduction guitar was ordered in late 2005 with the Jackson USA CS. 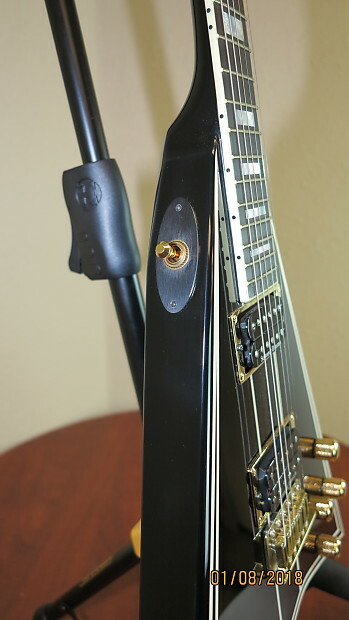 The body is maple and the quartersawn neck thru maple as well, and the non locking vibrato/tremolo is a reproduction of the tremolo on the original RR Concorde. 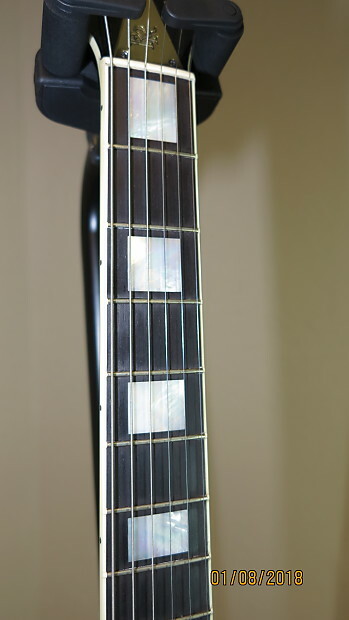 The tuners are Jackson USA and this RR Concorde guitar has a bound ebony fret board with MOP block inlays and 22 frets in new condition. 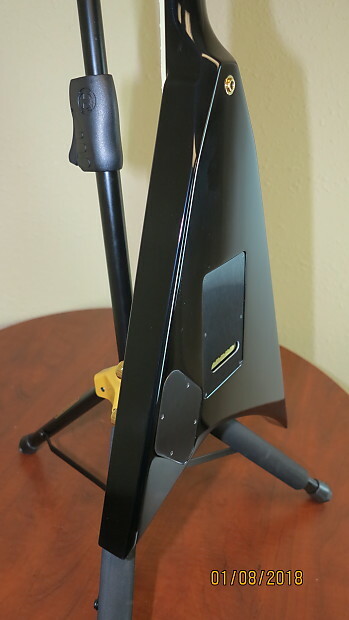 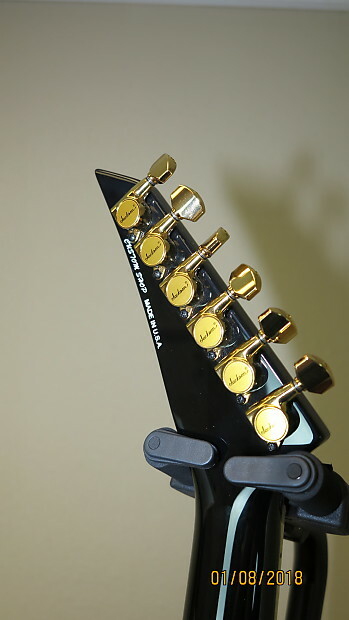 The guitar plays super with low action and neck relief was checked, although new owner may want an updated setup/intonation to personal preference. 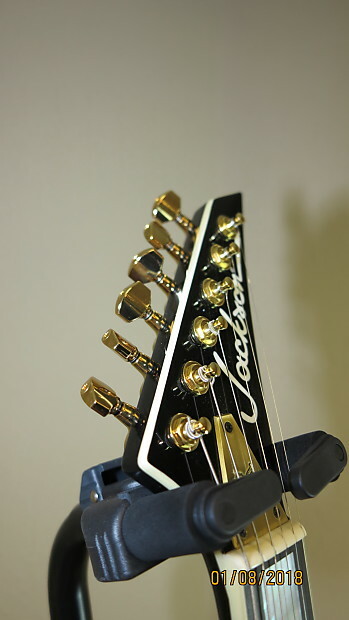 The headstock is bound also and the reproduction brass RR truss rod cover. 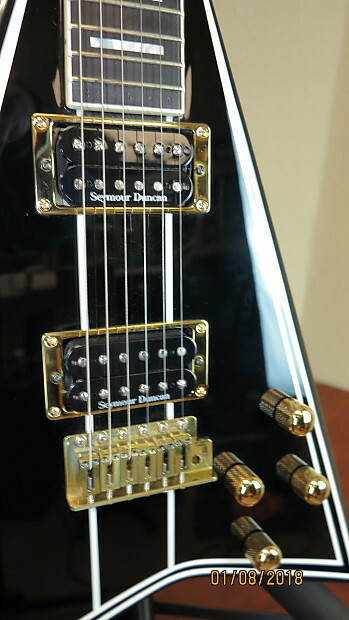 Seymour Duncan humbuckers with 4 metal volume tone knobs, and all hardware in gold including the unique 3 position top switch. 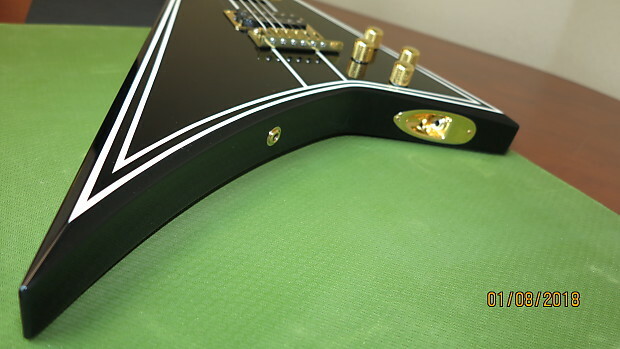 This collectible Jackson RR Concorde guitar was a special custom shop order from 2005/06, built special in reverse black with white pinstriping, opposite from the 1992 version of the RR Concorde that was white with black pinstriping. 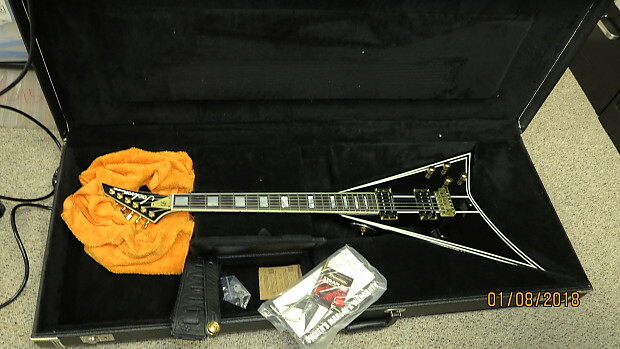 The first Jackson run of the USA RR Concorde reproduction guitar was made 10 years after the 1982 death of the late great Randy Rhoads in 1992, and that 1992 limited edition RR Concorde guitar was made in 1992 only I believe. 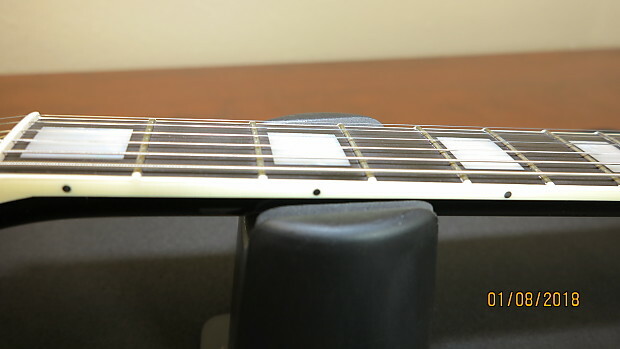 The 1992 reproduction Jackson RR Concorde guitar was only produced in white with black pinstriping and Jackson Pickups I believe, and only around 200 reportedly were manufactured total? 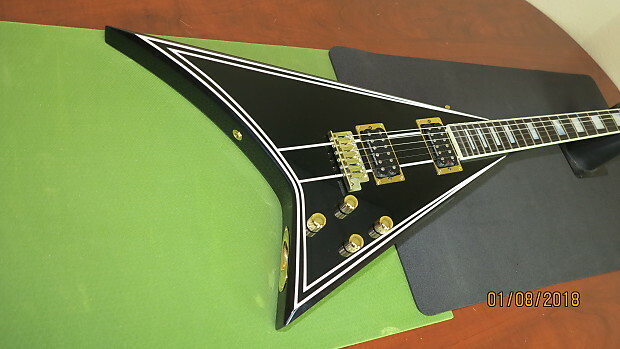 I do not think that the Jackson USA CS currently takes orders for any build of the RR Concorde reproduction guitars anymore. 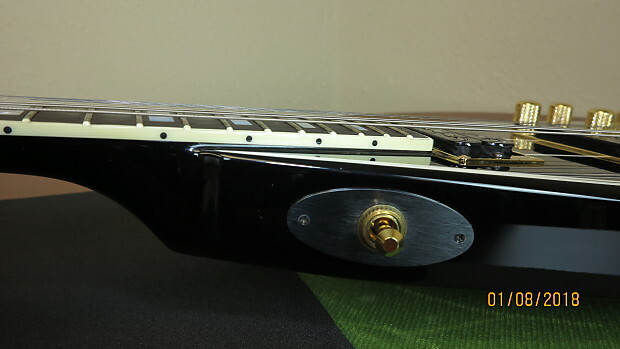 This special ordered custom shop RR Concorde reproduction guitar is a special ordered one off build to my knowledge. 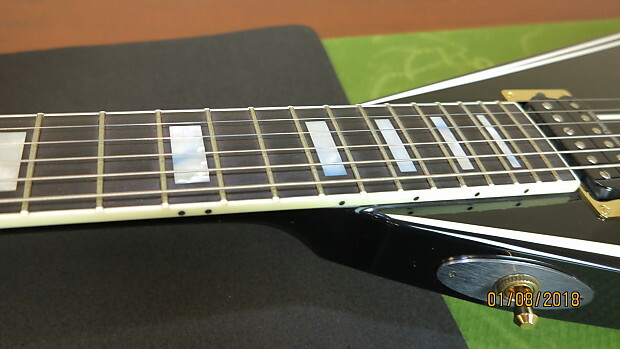 There are likely other special ordered Jackson USA CS RR Concorde Guitars that were built, but I have not yet seen another done in this reverse black with white pinstripes scheme. 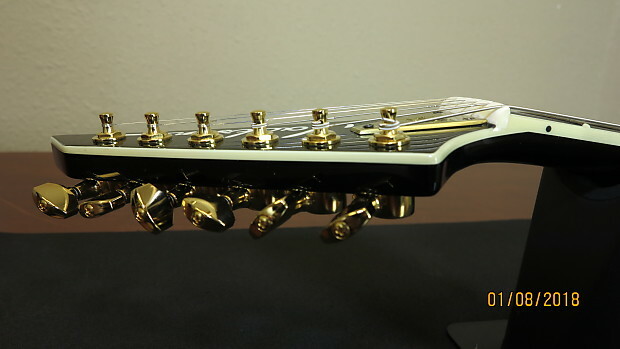 The guitar is basically like new never played or gigged at all and was bought as an investment collectible, and has not been taken out of HSC except for re stringing and pictures. 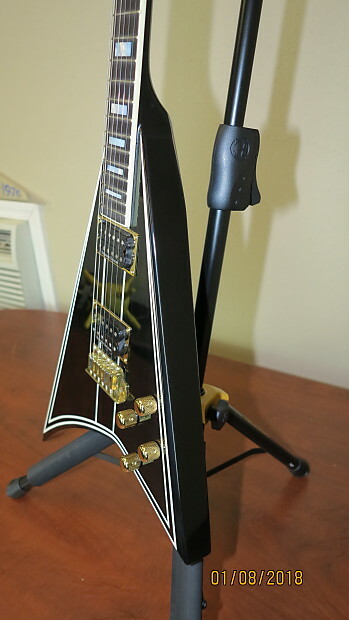 There are no real issues with this very collectible guitar anywhere the pointy ends are not damaged at all, the guitar is not mint or perfect but still in super excellent condition. 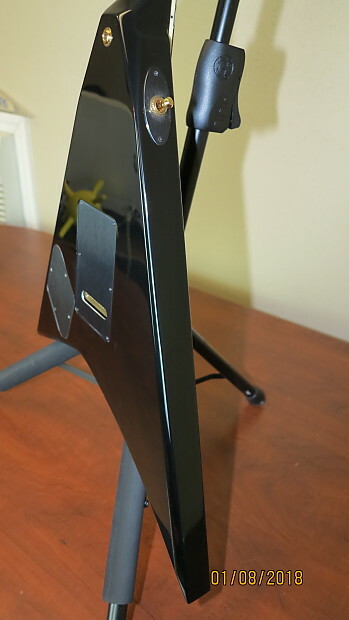 There are some very minor scuffs here and there and a couple very very minor dings barely noticeable. 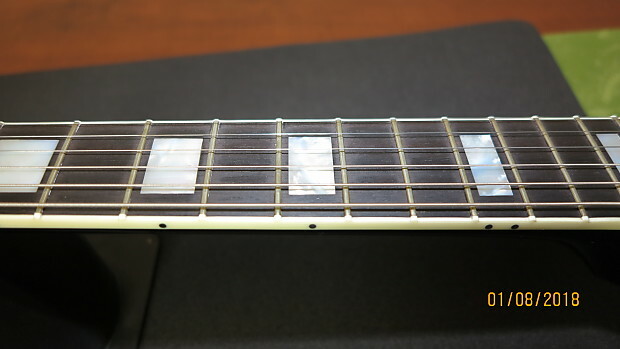 There is some small slightly visible oxidation in the input jack on bottom wing of the guitar, and the binding on this RR Concorde is like new still. 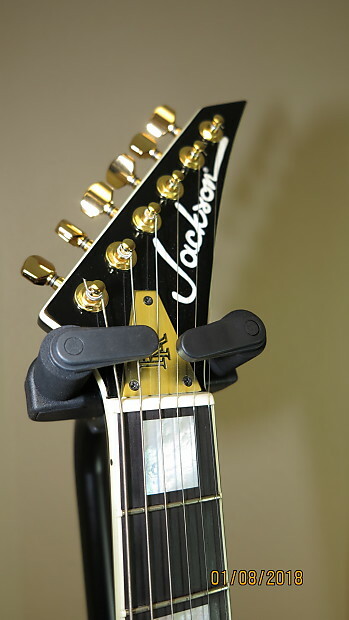 There is a Dunlop Strap lock set up on the guitar and it was built this way by the Jackson Custom Shop. 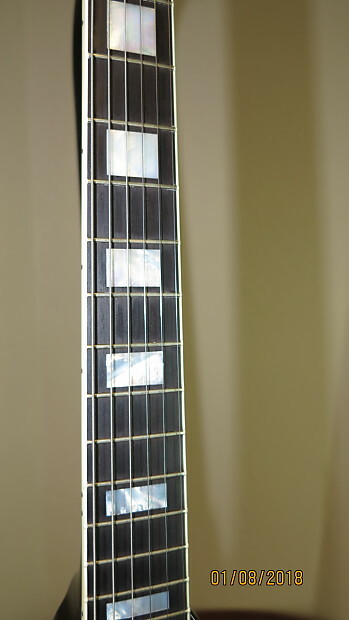 Included is a like new condition Levys brand leather strap with the matching Dunlop strap lock buttons in it. 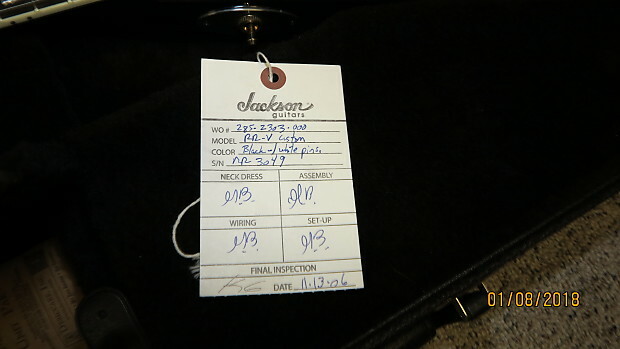 All the original case contents are included the truss rod and bridge adjustment wrenches, trem bar and owners manual with dated final inspection tag. 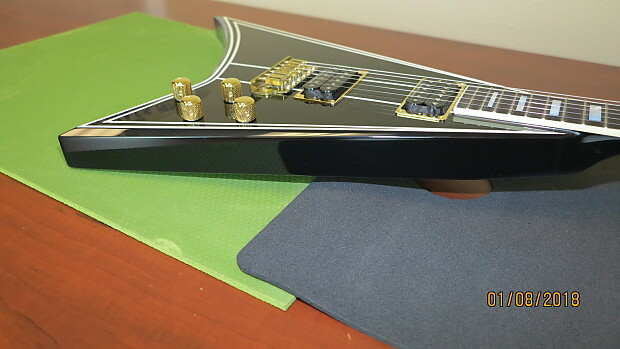 This rare special ordered USA Jackson CS RR Concorde guitar will be well securely packed with bubble wrap and or pack paper inside the HSC, and shipped in a sturdy U-line guitar box with additional pack materials to properly protect this guitar during the s&h. 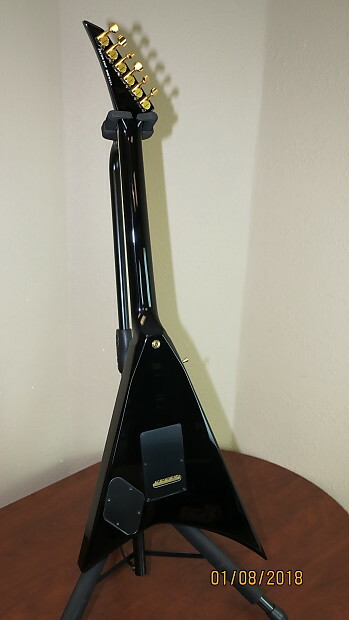 Shipping through Fed-Ex Ground insured for the declared value, shipping fee a bit more because of higher declared value and signature delivery required by Fed Ex.